Here is my 11th church micro, I have a ? CM cache Church Micro 4050...Wells Cathedral, for that note how many figures appear on the 4 pairs of south windows on the church and keep that for future reference. Where the cache lays is beautiful country head out south from here on the footpath. The Anglican parish church of St Leonard was built in 1843 by James Wilson of Bath and is a Grade II listed building. Stained glass in the north window of the nave commemorates Hannah More, who as part of her work to 'civilise' the people of Cheddar and the surrounding villages, particularly the lead-miners of Shipham, established the Shipham Church of England Voluntary Controlled School. A chest tomb to Amelia Day in the churchyard, 5 metres (16 ft) south of the nave, is also a listed building. Church of St Leonard Anglican parish church. 1843 by J Wilson of Bath. 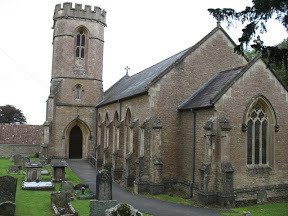 Coursed and squared rubble, slate roof, coped verges, "Gothic" Nave; small chancel embatted tower at south-west corner incorporating a porch to ground floor, tall bell chamber windows to hexagonal upper stage. gargoyles probably reused from earlier structure. Three bay nave, 2-light windows with simple tracery; 3-light east window, reticulated tracery. Galleried interior, elaborate arch-braced roof. Reredos appears reused from a C15 hood screen; 2 early C19 wall monuments; 3 C18 chairs; stained glass in north window of nave commemorates Hannah More. N yvggyr chyy va jurer gur pnpur ynlf arkg gb n avpr cbaq, va gur evtug bs n gerr purfg urvtug ghpxrq va sebz jurer n evtug natyr oenapu yrnirf gur gehax bs gur gerr!